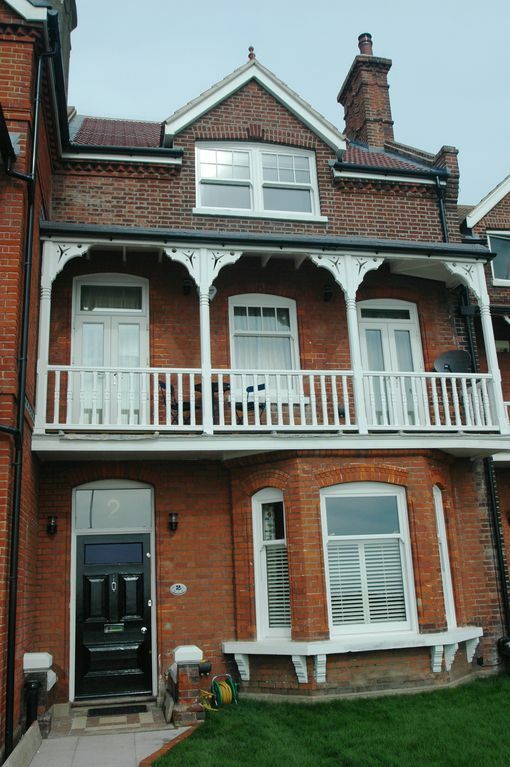 Our home in Broadstairs can comfortably sleep up to 10 (plus 1 cot). We have completely restored this fine example of Victoria family living yet ensured modern needs are more than catered for. With the Blue Flag beach of Stones Bay just feet away it will be difficult to tear your little ones from the sand. Vikings Bay and the centre of Broadstairs is a 3 minute walk away offering shops, restaurants, the Bandstand and even a Punch & Judy show on the glorious sandy beach. The house is child friendly and offers play tables, toys and a secure, walled rear garden to keep everyone happy at all times. Three beautifully appointed king sized double rooms and luxurious open plan kitchen with large dining space and living rooms ensure adults are also able to relax. Whether you choose to spend time inside (or the weather dictates! ), you will feel at home. Lovely, welcoming house right on the sea front, with plenty of space for our party of 9, with sea views and easy walking access to a nice sandy beach, shops and restaurants and a tiny charming cinema. We were two families sharing this lovely house overlooking the sea. It’s really well equipped, wonderful views, wood burner, children’s play area, comfy beds... I could go on. It was lovely. Gorgeous house, unbelievable location - can't fault it! We had a fantastic stay at this fab, spacious, family friendly home. Great communication from the host and no problem getting access. It's really nicely furnished, comfortable, stylish and we felt straight at home (well a bit jealous but ..!) The kids loved the space, all the toys, books and a wii - covered a cross section of ages, a real bonus. Great facilities and everywhere was spotlessly clean. Walk straight across the road and the beach is right there. Stone Bay although less sheltered than Viking Bay (therefore more wind) was much less crowded even on a very hot weekend which was great. Anyway, can't fault it and fully understand why it gets booked up so far ahead. Oh ... and the welcome note, supplies and gift much appreciated. Thank you to Alex and Family for having us! Just back from our third stay in this beautiful house. Four generations from ages 1 to 80 years old. This house has everything you could ever want and so many special little touches that make it just the perfect place for a break. You do not need to move your car, so many good restaurants close by and things to discover. The beaches are so clean and our 3 little ones had such fun and we all made marvellous memories. The house is very clean and beautifully maintained. It caters so well for young children which saves having to load the car up. Plenty of toys as well, and it we felt very safe and relaxed even with two 1 year olds toddling around. Alex, the owner is so easy to deal with and I feel he goes the extra mile to ensure you have a great time. Thank you Alex for letting us rent your home. We were all very sad to leave it. We are already looking to book for next year. We loved it! This home is everything you could wish for and more. It's even better than it looks in the pictures, it's incredibly well maintained and super clean. The (lots and lots!) of toys were an instant hit with the 4 children in our party (2, 4, 5 & 8) and the adults could therefore enjoy a quiet glass of wine by the wood fire. The kitchen is fully equipped with anything you need (including kids cups, plates, bowls and cutlery). The beds are very comfortable and the sea view when you wake up is amazing. The sandy beach is right in front of the house and shops and restaurants only a couple of minutes walk. We enjoyed every minute of it. Even though we had 3 days of mostly clouds and rain, we still enjoyed the house, toys, games, wood fire, beach and restaurants. We will come back! Our home is on the seafront directly overlooking the Blue Flag sandy beach of Stones Bay and a 3 min walk from the centre of Broadstairs and Vikings Bay. Golf: There are six, 18 hole courses within a 15 minute drive including the Royal St Georges at Sandwich, host to the 2011 open. Both St Augustines and the North Foreland courses are open to non-members. For younger golfers the Lilliputt Crazy Golf course is only a 10 minute walk away! Bookings can be taken by phone or on-line. A booking deposit of £150 is required to reserve your stay, which also acts as a security deposit. This is refunded 14 days after your departure (less any damage if incurred). Full payment of rental is due four weeks prior to your stay. Prices are based on 7 nights. Long weekend prices (3 nights) are also available as are off season discounts.